PEP GUARDIOLA HAS welcomed Yaya Toure’s apology for agent Dimitri Seluk’s outbursts against him, describing it as “good news for Manchester City”. 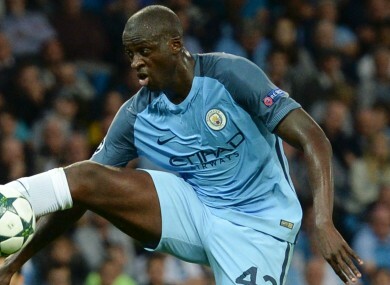 Toure posted a statement on Facebook, saying sorry “on behalf of myself and those who represent me” after inflammatory comments made by Seluk in the wake of the midfielder being left out of City’s Champions League squad prompted Guardiola to rule out selecting him for first-team matches. Seluk was on typically erratic form on Friday, conducting a radio interview with talkSPORT to insist he would not apologise to Guardiola despite earlier pledging in an article in the Daily Mirror never to criticise the former Barcelona and Bayern Munich boss in public again – his desire to “make the first step towards peace, respect and friendship” seemingly paving the way for Toure’s post. But Guardiola has chosen to focus on the player’s step towards a detente and confirmed to a news conference ahead of Saturday’s Premier League match against Middlesbrough at the Etihad Stadium that he held talks with Toure earlier that morning. “I spoke with Yaya today, of course it’s a private conversation. It’s good news for Manchester City,” Guardiola said. Email “Pep Guardiola: Yaya Toure apology 'good news for Man City'”. Feedback on “Pep Guardiola: Yaya Toure apology 'good news for Man City'”.